Research often takes us in weird directions whether you are a scholar completing a chapter for a book, a student working on a project for class … or an editor checking sources for a piece of copy. Coming across the unexpected is one of the best parts of the process, and an experience I went through recently. –Ed. In a recent blog post, I mentioned that ephemeral common knowledge is one of the hardest things to preserve since it is never considered important enough to record until too late. In that post, I detailed one conscious effort to preserve such information in the sector of public documents: the Library of Congress’s Popular Names catalog, which linked the popular and official names of government reports. […] ephemeral aspects of early American life have been frozen like ancient flies in amber. Within Leggett’s Index of Patents, ephemeral aspects of early American life have been frozen like ancient flies in amber. Two patent applications caught my eye in particular: one for something called an “office slate,” and another detailing a gear-driven advertising device. What can these applications tell us? 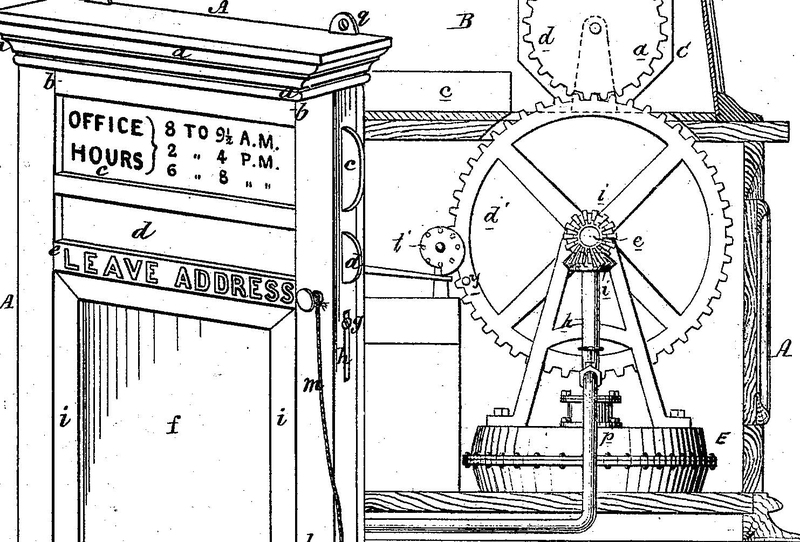 Patents in general give a sense of the technologies prevalent when they were filed. However, their accompanying write-ups and diagrams can also provide subtler information about the past, giving clues to historical business practices and daily routines. 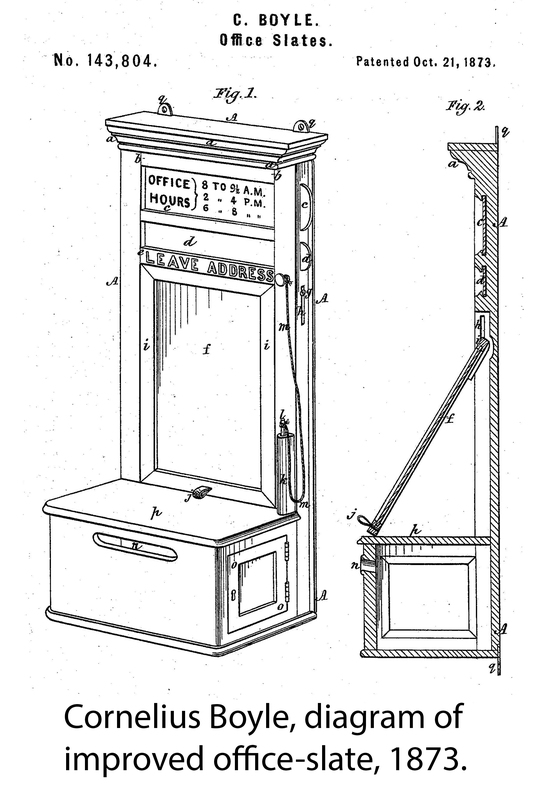 Such clues are buried in Cornelius Boyle’s 1873 improvement to the “office slate,” and an advertising cabinet devised by inventor William H. Reiff in 1871. Cornelius Boyle’s office slate patent reveals more about life in the late nineteenth century than may be initially apparent. Boyle’s improved slate was essentially a better-constructed bulletin board meant to be situated outside of a place of business. It consisted of a slate, an attached slate pencil, and a secured letterbox. The purpose of Boyle’s device was twofold: informative, providing information about the business; and inquisitive, soliciting information from prospective customers or other interested parties. Clearly these were a common item that would have been as familiar to those living in the nineteenth century as a dry erase board is to a current-day office worker. The proverbial “better mousetrap” implies an antecedent worse mousetrap, after all. The illustration itself holds more clues. Consider the odd office hours given by Boyle’s slate in the accompanying figure: “9 TO 9 ½ A.M./2 [TO] 4 P.M./6 [TO] 8 [P.M.].” These would be very strange hours for a business to hold nowadays, but their inclusion in Boyle’s archetypal image suggests they may have been more common at the time. After all, Boyle is patenting a new means of constructing these slates, not a new set of business hours. It is reasonable to assume that such ancillary aspects of the illustration were typical, at least in the inventor’s estimation. Please call as soon as you can at number 292 St. Mary Street: corner of Prytania. Lower corner—opposite the asylum. Let us turn this analytical lens on another patent found in the Index: one filed by inventor William H. Reiff in 1871 for an “Improvement in Advertising Show-Cases.” Reiff’s case contains a rotating cylinder to show multiple advertisements in sequence as well as a music box to get the attention of passers-by—a truly multimedia experience! The means of locomotion used by Reiff’s show case gives us additional clues about the world that it inhabited. 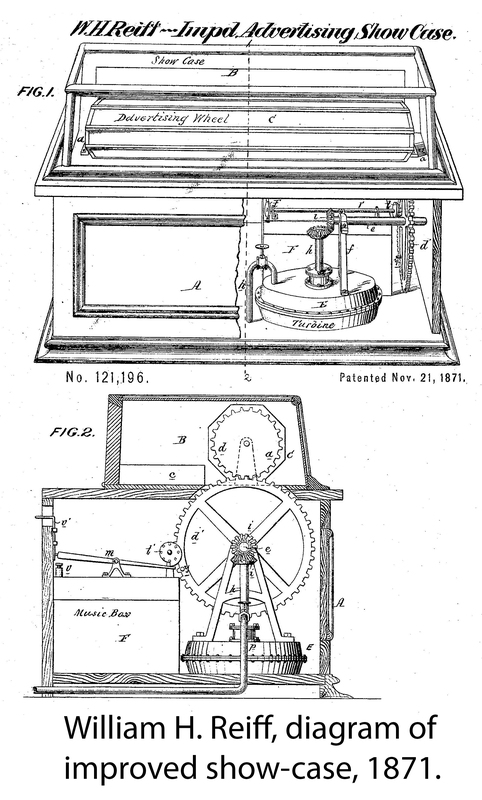 The internal mechanisms—the cogs driving the cylinder and music box—are propelled by a small water-wheel connected to a source of running water. Reiff’s inclusion of running-water-propelled mechanics suggests that this was a commonly-available mode of motive power. Reiff’s inclusion […] suggests that this was a commonly-available mode of motive power. Taking this assumption further, the reliance on water power suggests that this device was intended for use in urban locations with plumbing infrastructure, and not in rural areas without easy access to running water. Did Reiff choose this mode of power since advertising cases were a distinctly urban phenomenon, not usually found in rural locales anyway? Or was Reiff knowingly limiting the market for his device—a calculated trade-off in service of producing a fancier showcase? These questions are not directly addressed by the patent and would require further inquiry. In any case, Reiff’s patent forms a valuable link in a larger chain of research questions. These are only two examples among thousands to be found in the rolls of United States patents. What other clues to the past remain hidden in this vital store of historical documents? The answer to that question is open to researchers at all levels, and could form the basis of countless term papers, book chapters, or blog posts—one only has to take the time to look. Users of 19th Century Masterfile: 1106 – 1930 can access all 169,085 records contained in the Subject-Matter Index of Patents. Check your institution’s database subscriptions to find if you have access to 19th Century Masterfile, or sign up for a free trial at https://public.paratext.com/customer/. Users of 19th Century Masterfile can access more information on Leggett’s Index of Patents via its Resource Description, available under the “About the Content” tab on the 19th Century Masterfile landing page. Cornelius Boyle, Improvement in Office-Slates, US Patent 143,804, filed September 10, 1873, and issued October 21, 1873. George Washington Cable, “Dr. Sevier,” The Century Illustrated Monthly Magazine 5, 1884, 98. Henry James, The Bostonians, vol. 2 (London: Macmillan, 1921), 222. William H. Reiff, Improvement in Advertising Show-Cases, US Patent 121,196, issued November 21, 1871.